The latest update of Blogger now allows you to more effectively customize your search preferences using custom permalinks. Remember before how you would type in a title of your blog post and Blogger will automatically generate a permalink for you? It was quite annoying when Blogger gets your permalink naming wrong and it was impossible to change afterwards. Now, with this new feature, when you write a blog post, you have to options of using a custom permalink to give you more control of your blog and posts. These new custom links also provide readers with more information about your post when scanning search results. To use a custom permalink, you can do so via the "Permalink" option if the Post settings box. 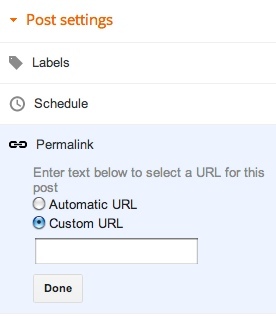 To create your own URL for a specific post, simple select "Custom URL", and enter your new URL in the field below. I have been wanting this feature for a long time now and I'm glad the Blogger team finally implemented it.